For the males who read this blog on a regular basis, I suggest stopping here. For reals. It's an all-around TMI post for you men, but an absolutely fabulous, must read post for the ladies. 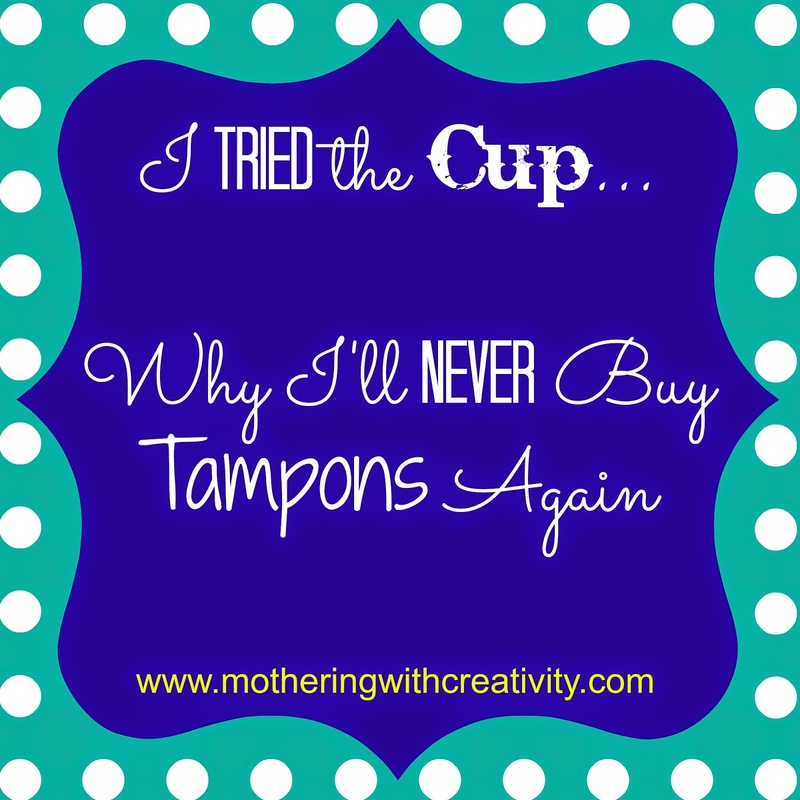 I tried the cup, and I'll never buy tampons again. A couple months ago I was walking through a natural foods store and this cup-like thing caught my eye in the ladies' hygiene section. I didn't give it much thought other than a second glance back to see what it was...and even still not really understanding and finding it odd. Fast forward to a couple weeks ago...a Facebook friend posted an article online about how menstural cups were changing lives in third world countries, enabling young girls to attend school even during their periods, and providing a sanitary solution to the caring for of this oh so lovely time of the month. Now I was CURIOUS! So I started to text said friend about her thoughts and if she'd tried it. I started researching just exactly what was up with "the cup," and I even mentioned it to my husband. Two weeks later, I ordered the Diva Cup from Amazon. Let me just say: Best. Decision. Ever. First, I'm really wondering how it took so long for me to even hear about the cup?!?! I can't be the only one, right? And secondly, I feel like every woman should know about this option. I don't plan on ever going back to tampons. *Made from health grade silicone-super comfortable and can last up to 10 years!!! *Free of latex, plastic, PVC, acrylic, acrylate, BPA, phthalate, elastomer, polyethylene, and free of colors and dyes-uh, goodbye chemicals! *Reusable and eco friendly- save the world...and your wallet! Basically, you wear the cup during your period instead of say, a chemically made, absorbent tampon. Since the cup collects instead of absorbs, there is no risk of toxic shock syndrome. And since it creates an airtight seal, you can wear the cup during day, night, sports, swim, or anything else! It holds one ounce at a time (the average woman's period is only 1-2 ounces in total), and only needs to be changed out twice per 24 hours (though you may need to change it more at first as you're learning to fit it in just right). Because there are no chemicals, there is NO SMELL! See?!?! Awesome, right? The cup costs about $30. So it's definitely a bigger investment the first month than a pack of tampons. BUT, considering it will last you up to 10 years, you will save a TON of money over time. ALWAYS wash your hands first. When you're ready to empty it, simply remove it and pour it out into the toilet. Wash with warm water, and reinsert. You really only need the hot water, but you can also buy "Diva Wash" if you want a friendly soap for your body and cup. Since you really only need to empty the cup twice per 24 hours, you really won't run into many instances where you need to do anything with it in a public restroom in the middle of the day. BUT, should you need to for whatever reason, just dump it out and use some toilet paper to wipe it clean. Clean it when you get home. Please don't gross people out by cleaning it in a public sink. And don't forget to wash your hands first! I found it fairly ease to figure out right away. That being said, I did have some minor leaking (like really minor, but still annoying). Wearing a liner while learning to insert it properly is probably a good idea. Can I wear it at night? Yes! It is a great night time solution! The Diva Cup comes in 2 sizes. One for those over 30 or who have had a baby, and one for those who are younger than 30 and have not had children. There are other brands of cups out there, too, though I'm not aware of their sizing. Overall, I am a huge supporter of the cup! I totally recommend it and think it is truly life changing! For people like teachers who don't often get breaks to go to the bathroom during the day, the cup is a perfect solution for full day protection. Not having to worry about it all day is a life saver, and really makes you feel SO FREE! And, not having to remember to bring tampons with you when you go out is a nice little perk, too :) I love that it will last me a long time (saving me money), and that my body is free of chemicals. Basically, I'm never buying tampons again, and I'm thrilled! So tell me, have YOU tried the cup? What do you think about it? Or, do you have any questions about the cup? Leave them in the comments below!